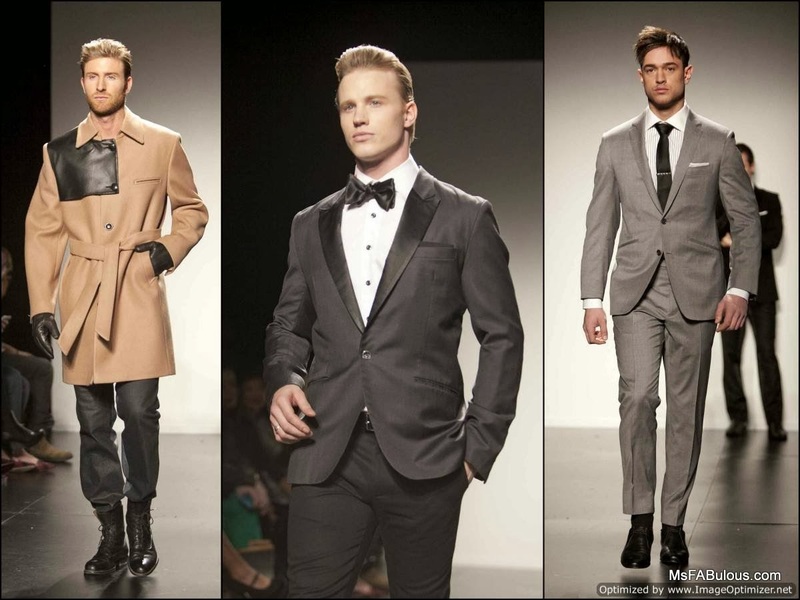 The Canadian fashion industry calls Christopher Bates the "James Bond" of menswear. That doesn't mean he has a license to kill. They are talking about the handsome designer's suave personal style which also translates into his collection. I thought I would spend the next week paying tribute to the guys by featuring menswear. Christopher Bates' Fall/Winter 2013 collection for World MasterCard Fashion Week in Toronto was sophisticated and refined. That did not mean stuff. The well dressed gentlemen strolled down the runway in a relaxed manner as the tuxedo clad creative director described the elements of each look. This fashion presentation felt intimate. From a writer and buyer's perspective, I found his format highly effective as you heard about the design intent, fabric and tailoring details directly from the designer's lips. It reminded of the old-fashioned collections in designer ateliers, where fashion "shows" really were for the important people there to do business. Christopher Bates is a highly skilled business man who drew quite a crowd in the panel discussions for new designers. Prior to his fashion training in Milan, is career background was in marketing and sales. I guess such an impressive background does earn him a "Bond" nickname in these circles. What is your favorite Canadian menswear brand?